As cosmopolitan as the city surrounding it, the Panama Marriott Hotel offers the elegance, outstanding service and amenities that you'd expect from a Panama luxury hotel. Soaring 20 stories above the financial district, it offers an ideal location for business and leisure travelers near shopping, entertainment and vibrant night life. Among the most preferred Panama City hotels, it's where you can share a delightful meal with family or friends at any of our 3 restaurants. Tempt Lady Luck in the casino. Stay fit in the fitness center, take a dip in the pool, or succumb to total relaxation in the indulgent spa. At day's end, you can retire to your spacious guest room that treats you to supreme comfort and conveniences like high-speed Internet and work area. 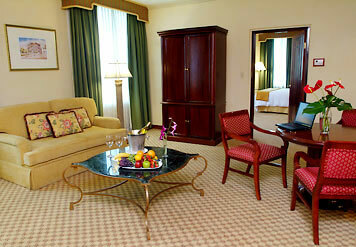 If you prefer, our executive levels and suites offer luxurious accommodations with upgraded amenities. 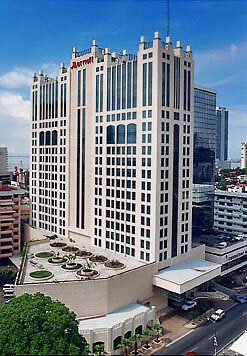 The Panama Marriott Hotel offers 16,390 square feet of impressive conference and meeting facilities, professional event management and Red Coat staff.